The industrial services provider Bilfinger is conquering new markets thanks to its scrubber technology. In the past weeks alone, the group secured contracts from several Greek maritime shipping companies to fit out at least 42 vessels with so-called ‘scrubbers.’ These are flue-gas-desulphurisation systems that filter out sulphurous exhaust gases by means of a special absorption process. The total contract value amounts to more than 40 million euros. The maritime shipping companies commissioning the work were Maran Tankers, Anangel Maritime, Delta Tankers, and Marmaras Navigation. Engineering & Technologies is the division looking after these contracts. The international maritime shipping industry must comply with significantly stricter environmental requirements. Most vessels currently are fuelled by heavy oil, which comprises a share of more than three percent of sulphur. The International Maritime Organisation (IMO) has moved to address the problem: Starting in 2020, the sulphur content of fuel is to be officially limited to 0.5 percent all over the world. As an alternative, IMO and the European Union are permitting exhaust gases to be desulphurised using flue-gas cleaning systems, so-called scrubbers. This reduces the sulphur dioxide concentrations in the exhaust gas emitted by heavy oil to the same significant degree achieved by the use of low-sulphur fuels (marine diesel and LNG), which are very expensive by comparison. Bilfinger’s scrubber solutions offer an all-in-one service package, including development, fabrication, and maintenance. Maritime-shipping clients can also select from a number of different scrubbing processes. 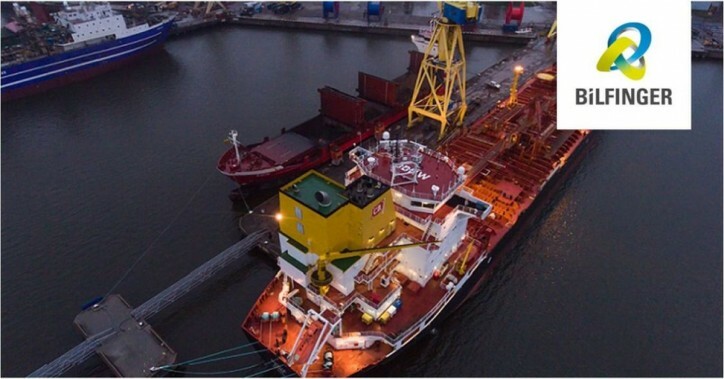 Given that the newly introduced thresholds will affect roughly 50,000 vessels, the market potential for Bilfinger’s self-developed scrubber solutions is huge. For two years now, Bilfinger has been on a successful track in this field. Take the maritime shipping firm Carl Büttner, for example, whose vessels have been riding the waves in a more environmentally-friendly way thanks to new flue-gas-desulphurisation systems installed in the fall of 2016. This showcase project was recognised with the International Air Pollution Prevention Certificate by the certification company DNV GL.